Tearing up your hand trying to get it out of the plastic was probably the most exciting thing about these games. I don't understand this, so in order to play with it do you crank the tail or something? 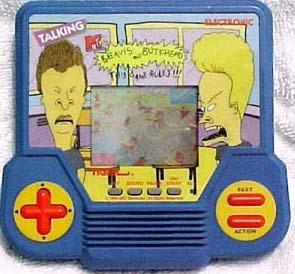 Also, was there really any other appeal to this game other than its odd design? The target audience for this game was probably too busy playing PlayStation (or smoking pot) to care about a subpar handheld game version of their favorite cartoon. Also, what possible plot could this game have? Polly's appeal was all in playing in her miniature world — this game just misses the point! Unless Fred was fighting dinosaurs, and not keeping them as pets, there is NO point to this game.